Although the visage of Martha Stewart is unlikely to spring to mind when my name is mentioned, and you won’t find a peppermint-pink chiffon apron hanging in my kitchen, I like to make things that taste good and look nice, especially this time of year. In addition to warm, cozy kitchen time spent making our famous holiday gifts of homemade cookies and the frighteningly addictive Reed’s Adirondack granola, I spend chilly time every winter working outdoors making ice luminarias, otherwise known as Adirondack Christmas lights. 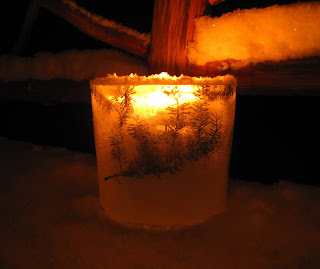 The beautiful ice luminarias are a favorite Adirondack 'craft' of mine because they meet, and actually exceed, my personal aesthetic standards. The basis of these looking-good benchmarks is my belief that neither I nor anyone else has ever done a better job at beauty than Mother Nature. One of my aesthetic rules is no plastic reproductions of real things like flowers or trees, or artificial gee-gaws, are allowed in my living space. I tend to collect and display Nature’s work of art; things from the outdoors like old bird nests and sea shells, pine cones, bark, and balsam branches. The ice luminarias are a perfect synthesis of my love of natural elements, candle light, and the healing effects of the natural world. Ice luminarias are a great Adirondack product as they require only cold and water to make, and we have plenty of that here in Lake Placid! Once arranged and lit they look lovely; candlelight flickering through the ice and balsam branches, they softly illuminate the gently falling snow. 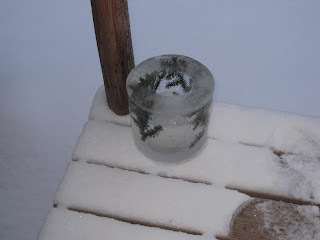 Here is a holiday present for my loyal readers who might like to participate in this wonderful Adirondack lifestyle: step-by-step directions for making Adirondack ice luminarias. 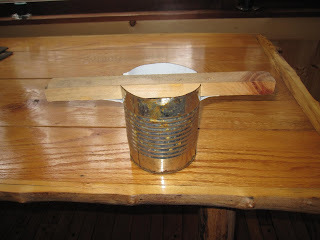 The gizmo is an empty tin can with a wooden 1 x 1 secured as shown. The tin can will float in the water if you don't add something for weight. We use wheel weights, but sinkers or small rocks will work as well. 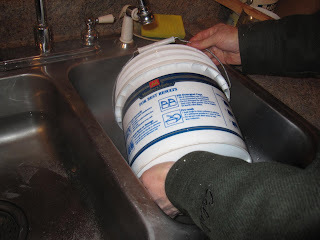 Fill the bucket with water and suspend the gizmo in the bucket as shown below. 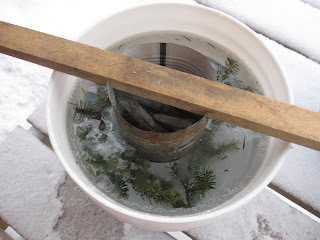 Obviously, the bucket stays outside in the very cold temperatures until the ice becomes slightly slushy. I like to add balsam branches at this point, but any decorative, preferably natural, elements can be added at this slushy stage. 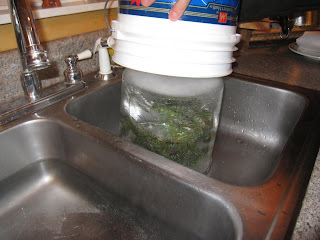 Once the bucket of water is frozen solid, which takes anywhere from 24 to 48 hours depending on the ambient temperatures, bring it inside and run hot water in the tin can. 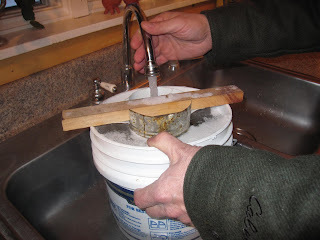 The warmed can will melt the surrounding ice a tad, loosen, and can be removed. Ta-da! Completed Adirondack luminaria - just add a candle and gently falling snow for a warm and welcoming outdoor holiday decoration.